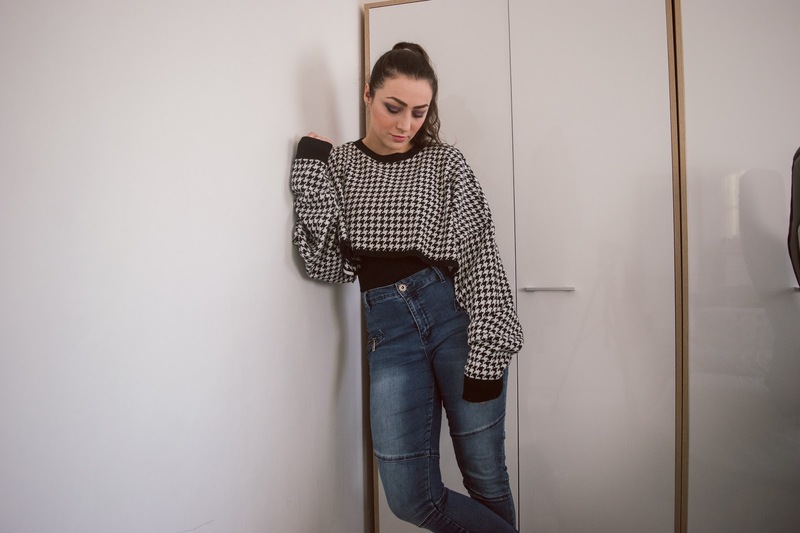 I love collaborating with brands and this weekend I'm so happy to be collaborating with Catwalk Clothing to bring you this outfit that I think is a perfect casual but fun look for a day out. 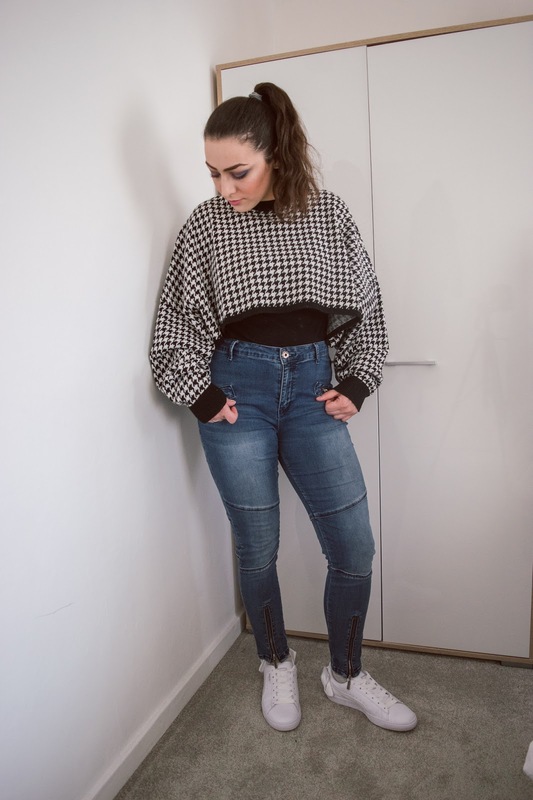 I love a jeans and top look and especially if it's something a little different but still classic like this houndstooth jumper. 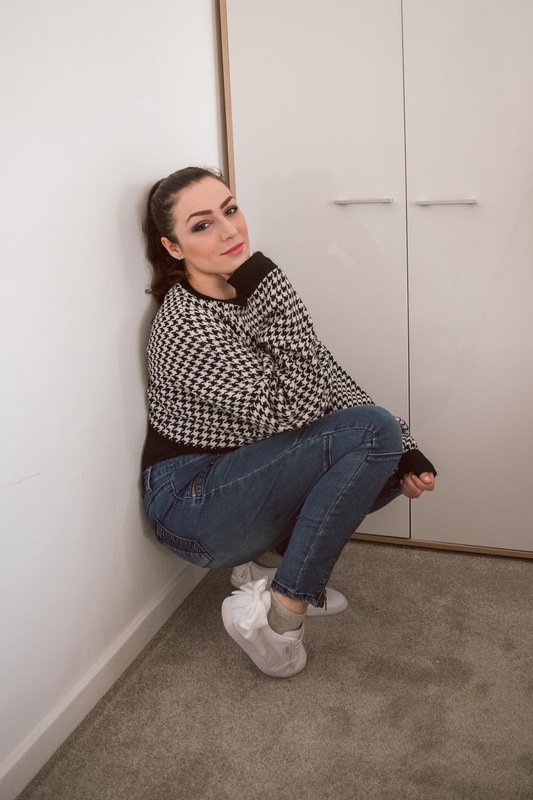 I've always adored the houndstooth print but I'd never actually bought anything with the print before, so when I saw this jumper, I just had to give it a go and see how I might style it. I'm not normally a fan of cropped jumpers, simply because I'm not one to show too much of my mid drift these days. I feel like this is a little too short for me to wear with a crop top underneath and I feel so much more comfortable styling it with a simple fitted tee underneath to keep it colour coordinated. I spent a good half hour desperately looking for my high waisted black jeans too but I couldn't find them for the life of me. So instead, I styled it with my next favourite pair of jeans from Simply Be. I like the colour of these more than anything. Jeans in general, I feel, go with a lot and this jumper and denim combo is no exception. I haven't showcased my new trainers either. I bought these in the boxing day sale and I think they look so cute. I haven't owned a white pair of trainers in a long time and I feel like I really needed a pair for outfits like this. A simple pair of trainers that are versatile enough to work with a bunch of different looks. I've loved wearing them with skirts, dresses and even more so, with a good jeans and top combo like this one. It's been a pretty busy couple of weeks recently thus having no posts last week and a bit. Not only did I have friends over last weekend, but we started picking up on some of the home improvements we've been neglecting. We've finally taken the horrible wallpaper out of my office and prepped it to paint and we also attempted to buy some of the furniture we've been looking for. It's hard to justify spending your money on something that is just available at the time instead of the thing you're really looking for. All we want is a really nice pine sideboard for the living room or a hallway table or bench to put by the front door. We've also got to get all the curtains up once and for all. It can't all happen at once though can it? Happy February too. I'm so glad January is over but February is always quite busy for me too. I've got car things to sort out but I've also got a week off to look forward to. That'll be nice. I hope January was nice to you.